Austin Pitre was born in February of 1918 in the prairie Cajun town of Ville Platte, Louisiana, to Joseph Lezime and Mary Aliza Pitre. His parents were share croppers & the family relocated frequently within the nearby communities to find work. Austin’s family would always sing as they worked in the fields, and at night they would play instruments and sing while resting on the porch. Austin’s father played fiddle, but it was an accordion he presented to Austin on his sixth birthday, in the hopes his young son would soon join him at playing the fais-do-dos. Austin was so small he could barely see over the top of the accordion as it sat on his lap, but by age 11, he was accompanying his father as a professional musician, often performing until 4 a.m. Later Austin also began playing the fiddle, but it is the accordion for which he will always be remembered. At the age of 22, Austin formed his own band, the Evangeline Playboys. His flamboyant playing style and energetic vocals and theatrics set him apart from other Cajun musicians of that era. During his performances, Austin loved to stimulate his audience with performance trickery, such as playing his accordion behind his back, over his head, and between his knees. He claimed to be the first Cajun accordionist to play standing up, without the aid of a shoulder strap. 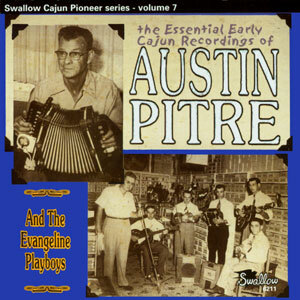 Austin Pitre and the Evangeline Playboys eventually became one of the most sought after Cajun bands in the area. Their popularity even saved a failing Cajun night club from closing its doors. Austin ended up playing there nearly every weekend for six years and even named one of his songs after the place, the Chinaball Club. Swallow Records was fortunate to have recorded Austin and the Evangeline Playboys in October of 1959, with several more singles following over the years. Out of that very first session came Austin’s biggest hits, “Les Flumes d’Enfer” and “The Opelousas Waltz,” released on a 7″ single. Austin and his band toured the U.S. over the years and were recognized with several awards. In 1973, Austin was even invited to perform and entertain fans in Washington, D.C. at the Smithsonian Festival in American Folk Life. He returned for that same festival in 1976 for the bi-centennial celebration. In 1980, the Louisiana Freedom Festival in Elton, Louisiana, presented Austin an award in appreciation for 50 years of contribution to and promotion of Cajun music. In March of 1981, Austin went on what would be his final musical tour for three weeks to different parts of the United States with D.L. Menard, Edward Doucet, and several other musicians from the Acadiana area. The following month, on April 8, 1981, Austin passed away at his home in Elton. In 1997 he was posthumously inducted into the Cajun French Music Association’s Hall of Fame. “The Flames of Hell” — even if Austin Pitre did nothing more during his hard knock life than fire up this blazing shot of Cajun hyperactivity, dancehall immortality still would have been granted. Because those fabled two-and-a-half minutes ended up launching an Acadian staple that’s nourished Saturday night setlists of countless Louisianan bands. However, Pitre’s legendary status rests on bedrock far sounder than one mega-influential song. There was the ability to power out dance-crazed melodies from an accordion, even if famously hoisted behind his head or tucked between his knees. There was that turpentine voice, capable of crushing the sensitive with its glorious paint-peeling powers and exclamatory shouts. There were his Evangeline Playboys, who’d pump the added thrust of rawhide fiddles, steel guitar, and drums into their boss’ brutal brilliance. And there is a catalog of unbridled performances, starting with these Swallow gems which include that historic 1959 cut, the muscle-bound swing of “Lakeview Special,” the airtight density of “J’ai Cogner a Ta Porte,” and the mournful momentum behind “Jungle Club Waltz.” Yet of all, “You’re the Only One for Me” slugs the hardest. It’s one of several rough-cut diamonds that haven’t seen the light of day until now. And it’s as close to perfection that a Cajun barroom blitz can get: accordion surging through the bandstand roar, French cries wildly puncturing the din, the cumulative loudness saturating the sound levels. But, then again, pretty much everything that Pitre did burned like hell.